Lerwick is a town in the Shetland Islands, an archipelago north of the Scottish mainland. 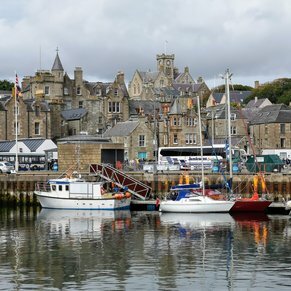 Historically a major fishing port, Lerwick today attracts those drawn to the combination of Norse and British culture in the area. Every January, the Up-Helly-Aa fire festival features a Norse ship that is dramatically dragged through the town and burned. Loved visiting these secluded islands. Serene with lush hilly landscapes like I had imagined. 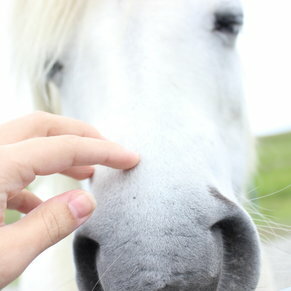 We did a short excursion to visit Shetland ponies which was fun. Then we strolled through the shops in Lerwick which was a charming town. Once again, we took the included tour in the morning, then were on our own afterwards. And once again, they wasted our time by insisting on taking us back to the ship, then we had to wait for a shuttle to take us right back into town, WHICH WE HAD DRIVEN THROUGH TO GET BACK TO THE SHIP. They need to fix this ridiculous policy and allow people on the bus tours to get off in town, rather than having to go back to the ship before heading back into town. After the bus tour, we headed out on our own again. We were not able to book the tour to Mousa Island through Viking since it was sold out (despite the ferry captain telling us that their ferry was nowhere near sold out), so after the included tour (which did not go to the south part of the island), we rented a car and went to Mousa Island on our own (we literally had the ferry to ourselves, heading to Mousa five minutes after the Viking tour got back), then further south to Jarlshof and the Sumburgh LIghthouse (with loads of puffins and other seabirds). Fantastic way to spend the afternoon and early evening. 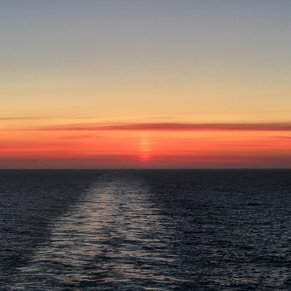 It was lovely to have a late port departure (7:30) for a change. a surprise to see. The port town was great to wander with many of the stores trying to figure out what to sell for tourists. We did most of our shopping here from the outdoor store to Shetland wool stores. Many of us said we wished we had bought more after getting back to the ship. This town is beautiful with great prices on souveniours. Get a scone and a coffee! We did a tour on one of the islands south of Lerwick--beautiful countryside. The WK06 - Mousa Island Discovery excursion was a drive and ferry ride out to the island and a few miles of walking around the island. The timing gets you back to town in time for lunch. Do not waste time, the restaurants stop serving lunch at 2 PM. That said, the museum was excellent with several high quality exhibits and thorough explanations of them. 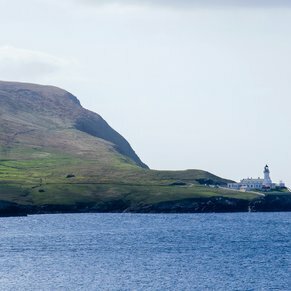 There are currently 0 discussions about Lerwick, Shetland Islands, Scotland.